UPDATE: Kazoozles are NOT discontinued, they have just had their name changed. They are now called Sweetarts Ropes. I got this bag of Wonka Kazoozles as a free sample from the Nestle booth at Sweets and Snacks. It was strawberry melon-flavored “delickoricious chewy candy”. Delickoricious is a ridickoricious word. I’m not sure how close my sample was to the final packaging, as it said “sales sample – not labeled for retail sale”, and though it claimed that it contained “2 strawberry ropes with watermelon filling”, my bag had 4. The bag itself was crackly, and its inner surface was reflectively shiny, like mylar. 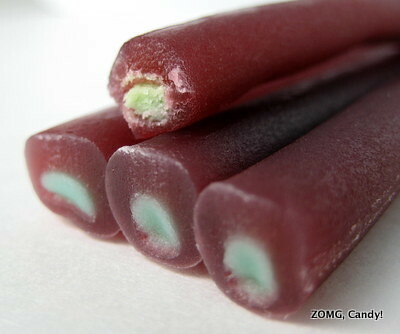 The Kazoozles looked like red and green versions of my beloved filled licorice pencils and smelled like a bag of red fruit snacks. Each was about 6-inches long and softly floppy so that its top half slowly bent over when I held it upright. Ridickoricious. 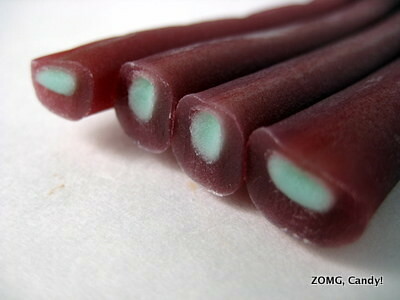 The candied red outside was stiffly chewy, similar to a Twizzlers but softer and less stick-in-your-teeth-y. It tasted of sweet fake berry with just a smidge of plasticky undertone. The green center was a finely grainy fondant with the texture of dried up frosting. I didn’t get any watermelon flavors, candied or otherwise; it just tasted generically sweet to me. As the Kazoozle’s chew continued, that sweetness intensified and brightened near the end. It wasn’t a super classy or fancy candy, but I enjoyed it enough. It’s not quite the perfect replacement for licorice pencils – Kazoozle’s have a higher rope to fondant ratio than the fatly fondant-y pencils that I like – but it’s pretty good. An O. I’d give it an O+ if I could; it’s not quite at OM level. 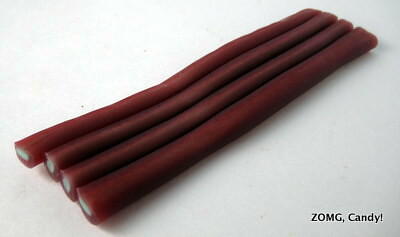 Cybele from Candy Blog reviewed a different iteration of Kazoozles a few years ago. Hers look fatter and actually were 2 to a package.